I had a vision when I got up on Saturday morning, a vision of beautiful attacking football, of crisp finishing and resolute defending, and of generally good officiating. And I was surprised in that this came to pass. However, that was Everton's 3-1 defeat of United that morning. The Arsenal v Sunderland match wasn't quite what I was dreaming of, but in the end it gave us what we needed. There were two rather significant changes from the squad who faced off against Porto on Wed. night: Silvestre came in for Campbell (who was filling in for Gallas), and Ramsey replaced the injured (shocking, I know) Abou Diaby. I thought Campbell was one of the few bright spots against Porto, so replacing him clearly had more to do with fitness than anything else. This is the problem with Campbell as a backup. Any long term injury (*feverishly knocking wood*) to one of our central defenders will require two players in rotation to play in that place. It's just not sustainable. I understand Sol is 35, but he's also a professional athlete. If you're getting paid to do the job, the least that should be required is that you be fit enough to accomplish the tasks required. 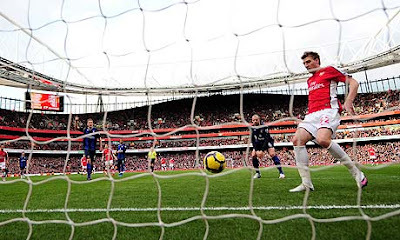 I have to say I was glad to see Ramsey given another shot instead of Arsene automatically selecting Denilson. What we got out of Ramsey was energy, tenacity, and pace, three qualities that have been sorely lacking in the Brazilian's efforts of late. From the start, Sunderland appeared to sit back with the entire team behind the ball and defend. Having dropped as many points as they have in the past few months, and limping into this match like a wounded animal, I can't say as I blame them. But all this really accomplished was to ensure Arsenal dominating possession and thus create more chances. It seems what Steve Bruce was trying to do was try to catch us and hit us on counterattacks like United had done a few weeks ago. However, all necessary respect to Steve Bruce and each of his chins, Sunderland are not United. What was clear was that for all that possession and all of the chances created, Arsenal still have a very hard time finishing. Bendtner had a great chance in the box where he was one-on-one with the keeper for a moment, and just took too much time setting up his shot, which was blocked by the Sunderland keeper Craig Gordon and bounced off the bar. Eboue, starting at right back, made several forays into the box without doing much until finally, after dancing with the ball for what seemed like minutes and, I can only assume hypnotizing the defenders, slid a pass that may have been a shot directly into the path of the onrushing Bendtner, who finished with ease. It's a goal that will do his confidence a world of good, and him being a confidence-player that can only help us. Theo Walcott got the start on the right wing and played fairly well considering his recent form. Basically, when he got the ball I found myself screaming for him to run like he was a horse I'd bet on, and he is blazing fast. But he still is clueless as to what to do with the ball when he does get past that last defender. His shots were all quite errant, and his passes, with few exceptions, weren't to anyone in particular. The other issue is that he needs a great deal of space in order to be effective, and the better teams, the Chelseas and Uniteds, do NOT give him that. In fact, this is the first match since he's been back where Theo has had that kind of room to run, which is probably why he was more effective. But as a footballer, he currently leaves a lot to be desired. We stayed at 1-0 up through the bulk of the second half, and the story remained largely the same. In spite of a handful of chances for Sunderland (caused by poor defensive marking and positioning), which would have been goals had it not been for Kenwynne Jones being so crap, Arsenal dominated the possession and had the upper hand throughout. The only other point I would make was the terrible officiating. After the displays on Saturday and Wednesday, it seems that referees have declared open season on Cesc Fabregas. Like Porto, Sunderland fouled our captain without rest or fear of retribution, from either Arsenal players or the referee, Steve Bennett. At one point, Bennett booked Cesc when John Mensah fell over, without contact that I could see in slow motion, and rolled around. Later, Mensah himself made bad tackles on Cesc yet received no mention. And don't even mention Lorik Cana. The Albanian was unpunished after one particularly bad challenge on Eboue, going in studs-up with two feet, and doing so to take the man out. Eboue went down and limped about for a while, and nothing was done to Cana. Crack refereeing there. And by that, I mean you'd have to be on crack not to discipline that sort of thing. In the end, we finally received our second penalty call since "the Eduardo incident" in August. Cesc took a quick pass from Bendtner into the box, where he was upended on the edge of the area. To my astonishment, Bennett pointed to the spot. Up strode El Capitan Catalan Fantastico, and the penalty was converted. 2-0 secured the points late on, and even though it wasn't the prettiest match, we got what we needed. Does this change the fact that our defense (Silvestre in particular) has a tendency to lose focus and look positively shambolic? No. Nor does this mean that Arsenal's best shooting boots have been anywhere but in the back of the closet for a good long time. Still, we needed a victory after Wednesday's shock defeat at Porto, and we got one. So while questions remain, we picked up three points on United and kept pace with Chelsea. And that is no bad thing. Next up we revisit our FA Cup loss at Stoke City looking for a bit of revenge, and this time we're bringing our first team (what's left of it). Let's hope we've got enough to do the job this time, but I'll save my thoughts on that for another time. Until then, stay classy, and Keep the Faith.